Adventurer and author Anna McNuff joined some of Uxbridge College’s most inspiring students and employer partners to celebrate their achievements at an awards night recognising their success. Anna, whose incredible endurance feats including cycling through every state in the USA and running 3,000 miles from one end of New Zealand to the other, is also the author of Pants of Perspective about her 148 day Kiwi trip. As well as presenting the awards, Anna talked about her life and adventures and then shocked everyone by ripping off her baggy walking trousers mid-sentence to reveal the authorial pants – a pair of lurid Spandex leggings decorated with rainbows, a unicorn and a wolf! Students and employers who work with Uxbridge College received their awards from Anna and had their photos taken with her. The overall winner, who took away the Super Star prize, was Travel & Tourism student Chelsia Afonso. Chelsia has gone from strength to strength, excelling in her studies, volunteering and being chosen as a British Airways Inspire Student Ambassador which as part of the role saw her as one of the passengers on an all-female flight with Carol Vorderman to commemorate International Women’s Day. Chelsia started at College on a Level 2 City & Guilds Cabin Crew course, going on to complete the Level 3 Extended Diploma in Travel & Tourism which enabled her to gain a place at the University of West London on the BA(Hons) Airline & Airport Management course. She also won a Jack Petchey Award for volunteering on Open Days and Parents’ Evenings and was chosen for a Highly Commended Award in the national BTEC awards. 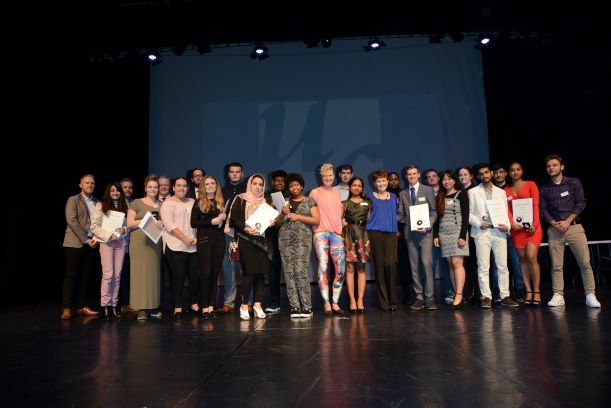 Principal of Uxbridge College, Laraine Smith OBE , said : I would like to say a huge congratulations to all our student and employer winners at this year’s awards, as well as a really big thank you to Anna McNuff for making the evening so special. Whilst our awards are partly about some of the more apparent forms of success such as excellent grades and high pass rate, what really shines out among our winners is what they achieve as individuals during their time at college, be it through the challenges they overcome, the journeys they go on or the people they turn into as they take up opportunities in and outside the classroom to fulfil their potential. I’m extremely proud to be at the helm of such a fantastic organisation that continues to make this possible for young people and adults year on year. The event held at the Beck Theatre in Hayes recognised winners from across the College’s academic and vocational programmes including GCSEs, A Levels, BTEC qualifications, Apprenticeships, HNDs and from among the 1,000 employers with whom the College works.